Steel girder fencing first appeared in 1908 in the Mayes catalogue, which was an Australian builders and contractor’s price book written by C.E. Mayes who was a civil engineer. In terms of types of Australian fences, these were over three feet in height and constructed of 5 feet 6 inch posts at 21 feet centres, with two droppers between each. Fence droppers helped to maintain a fence’s integrity and avoid wire breakage. Tensioned between the posts were five black wire strands of 12 or 14 gauge with a top strand that was barbed. 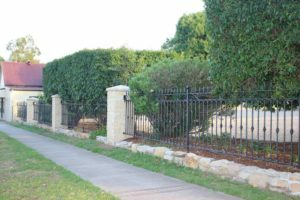 When discussing the history of Australian fences, it’s also worth mentioning fence droppers themselves, which were available in a range of configurations and sizes. Patent steel posts and droppers manufactured by a company called Petit’s Geelong came in 1.5 x 1 inch or 1.5 x ¾ inch sizes and had six holes for the wires, the top hole being slotted to receive the barbed strand. Others available around 1908 were the King-Loc variety which came in 30 and 45 inch lengths and the Pages’ simple dropper which was 22 inches and the seven tongue dropper which was 42 inches in length. Before 1914, a company called Cyclone were also manufacturing droppers in six or four gauge steel and in 30, 36, 42, 48 and 54 inch lengths. Other brands around at this time included Federation, which manufactured droppers for six and six-strand wire fences and Auto Screw which manufactured corrugated steel droppers in 15, 25, 34, 46 and 60 inch lengths. By 1927, these companies had been joined by a company called BUZACO, which manufactured galvanized crimped droppers in four and six gauge and 28 to 46 inch lengths. By 1934, King-Loc and Crimped droppers were also manufactured by the Cyclone company. When looking at the history of rural Australian fences, post-and rail fences were a common variety available around 1914. Stringybark or eucalypt timber was felled, sawn and split for use as what was called ‘three-rail fencing’. This consisted of posts that were 7 feet x 9 inches x 4 inches with rails measuring 9 feet x 6 inches x 3 inches. Split slab post-and-rail fences were also popular and the manufacturing process involved ironbark or stringy bark being felled, sawn and then split into slabs. These were fastened to post-and-rail fences and were available in two sizes – 3.5 feet x 11 inches x 1.5 inches and 5.5 feet x 11 inches x 1.5 inches. Cyclone spring coil fencing was also manufactured, assembled in five-chain (100 metre) mesh rolls and crimped to give elasticity. The fence consisted of horizontal strands with vertical sections called crossties and it was advertised as being improved by having posts placed further apart. In 1895, timber field gates were illustrated in a catalogue published by James Moore who was a lawyer, banker and pastoralist. These had five bar rails and three tiles, with an inner section that projected above the top rail to support the metal bracing tie rod. In terms of rural Australian fences the Cyclone 1910 catalogue only illustrated one type of farm gate which was known as the ‘N’ type. It was 10 feet x 4 feet in size and N-shaped struts were bolted to the top and bottom roles at the ends, and clipped then at the elbows. These held taut horizontal wires that consisted of two strands of 9-gauge wire. By 1934, the standard height of a Cyclone gate was 3 feet 10 inches, the junctions were welded and galvanizing was also available. Galvanizing involves coating an iron or steel fence with a protective layer of zinc. When it comes to fences in Australia, timber stock gates were one of the more popular styles in this period. These gates usually pivoted on a metal pin or a whittled post end that was set into a stump that was sunk into the ground. Top hinges traditionally had a metal collar or a length of steel rod that was bent around the post. These gates were fastened closed with either a looped chain, or in stockyards by a sliding locking piece made of timber. These types of gates were constructed of wire with a moveable post at one end, and they provided the widest opening. The gate wires were terminated with a long lever that pivoted from a pin set into the bottom of a fixed post. A second variety around at the time had a lighter, longer lever and a holding pin that was set into another post about a metre away from the gatepost. Dairy cattle gates of this type were often narrower and fastened with a short lever consisting of a piece of timber that was attached to the gatepost with a twist of fencing wire. Fencing sliprails are a set of movable rails that can be taken out to form a gateway, and sliprail fencing traditionally consisted of a few light sapling poles that were thrust through holes in the gateposts. Alternatively they rested on angle iron brackets and in earlier versions, horseshoes performed this function. Industrialist H.V. McKay also manufactured another version of a rural Australian fence in the agricultural equipment factory, Sunshine Harvester Works in Melbourne. This was a six-bar gate 1740 x 975mm in size. It was made from wrought steel rods of 20mm in diameter which screwed into decorative cast-iron connections. Examples can still be seen today at the St Agnes Homestead in Kyneton, Avenue of Honour in Ballarat and at the Point Cooke Homestead in Point Cooke. Like to add a touch of nostalgia to your wrought iron fence? Contact the experts at Dean-Wilson Iron on 3814 0076.